Bath time can sometimes be a challenge for parents with young toddlers, especially if your child does not particularly enjoy having a bath and kicks up a fuss. Making sure you have a few of the best bath toys for toddlers guaranteed to keep them enagaged and entertained, can make it a more fun and pleasant experience for you and your child. Choosing the right bath toys can help keep your toddler distracted, entertained and engaged while you bathe them and wash their hair. With the right toys, it can be a really good bonding time for your and your child that you both start to look forward to when bath time comes around. With that in mind, we have spend hundreds of hours researching the best toddler bath toys keeping safety, quality, value for money, and most importantly the fun factor, in mind. Boon Bugs are fat little floatable bugs that are designed for your toddler to play with in water. It comes with a hand held net that allows your child to capture the bugs. 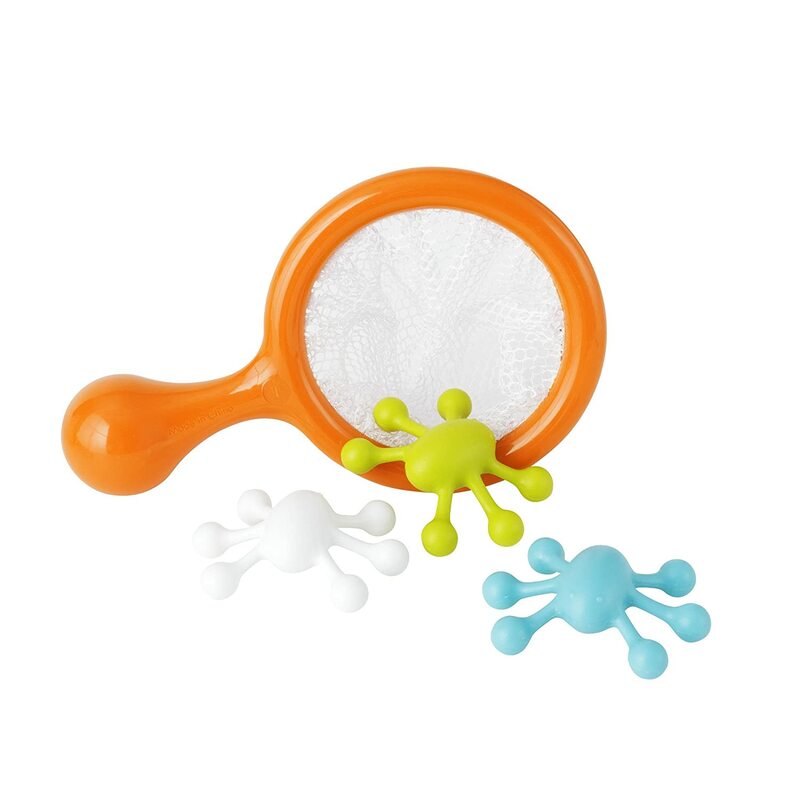 Both the net and the bugs float and the whole toy is a wonderful fun activity for bath time. Boon bugs would make a wonderful birthday or Christmas gift for 1 year toddlers. These bugs and the nets are BPA and Phythalate free. The recommended age for these cute boon bugs is 9 months old and upwards. 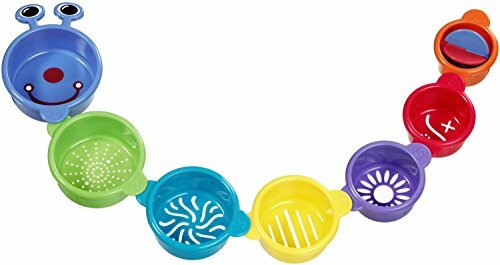 The Nuby Splish Splash Bath Time Stacking Cups is a set of 5 colorful BPA Free stacking cups with drain holes in the bottom in different shaped designs. Toddlers love creating a waterfall effect with these brightly colored cups. They provide great entertainment at bath time. The recommended age is 9 months old and upwards. A wonderful birthday or Christmas gift idea for toddlers and babies alike. 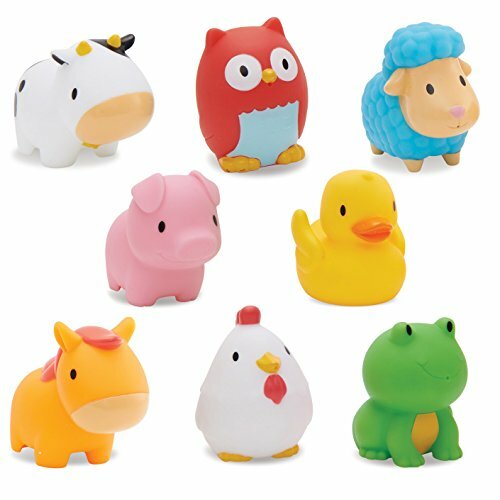 If your toddler loves animals, and what child doesn’t, then they will love these Munchkin Squirtin Bath Toy Barnyard Friends. This set of barnyard animals includes 8 little animals that can be found on a farm. So your child will get a cow, an owl, a sheep, a pig, a duck, a horse, a chicken and a frog. Your toddler will have their very own MacDonald Farm! Totally suitable for both boys and girls, these cute farm friends will provide your little one with endless fun at bath time. Given that these are squirters, allowing water inside, you need to keep them clean and dry to prevent mold and mildew. Some parents use a chlorine solution every 2 months to keep them clean and mold free. Others chose to use hot glue to seal up the holes and prevent water going in. It’s very much a personal preference. While the recommended age is 9 months old and upwards, some parents have bought these for babies age 6 months old. Toddlers love learning how to squirt these toys and find them super fun! TIP:If you are concerned about mold or mildew growing inside this bath toy, then you run a sink full of water with some bleach, draw in the bleach water and then squirt it out. Then rinse in fresh clean water and allow to dry. 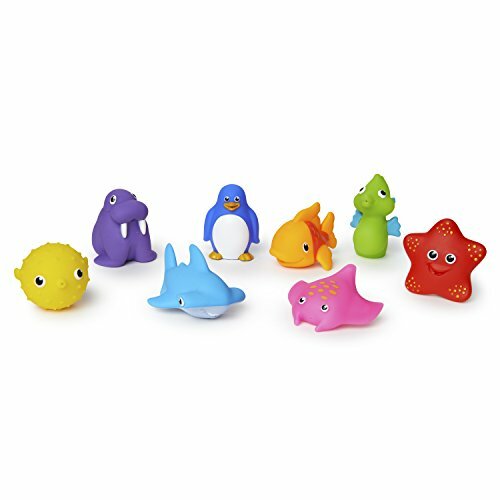 The Munchkin Squirtin Bath Toys Sea Buddies will introduce your toddler to 10 fun and interesting sea creatures including a dolphin, whale, star fish, snail, sea horse, penguin and more. These super cute sea buddies are suitable for both boys and girls. While the recommended age is 9 months old and upwards, parents have bought them for their baby age 6 months and up. The sea buddies are squirters as well, so they will allow the water in. As we mentioned in the previous bath toy product, if this is a concern because of mold or mildew, you have some options. Some parents chose to hot glue the holes up and just use the bath toys as toys and not squirters. Other parents used a chlorine or bleach solution to clean the sea buddies every couple of months, which worked well. They draw in water and then your toddler can squirt it out, providing lots of fun at bath time! TIP:If you are concerned about mold or mildew growing in this bath toy, then you can run a sink full of water with some bleach, draw in the bleach water and squirt it out. Then rinse in fresh clean water. 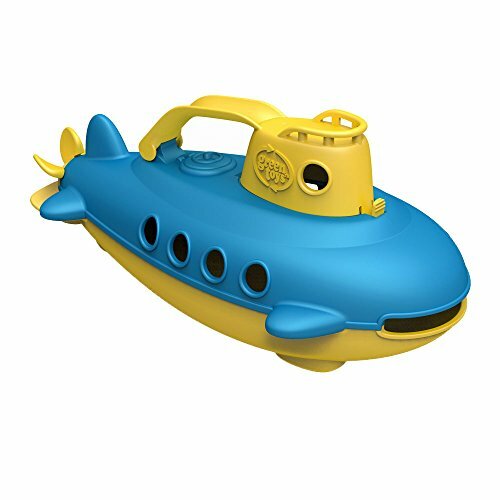 This Green Toys Submarine is made from recycled milk jugs and is Phthalate and BPA Free. It is made in the USA by a company called Green Toys, who pride themselves on creating environmentally friendly toys for kids. While the colors are yellow and blue, you have 2 choices available: a submarine with yellow as the main color, or a submarine with blue as the main color. It is suitable for both boys and girls. The recommended age is 6 months old to 6 years old. 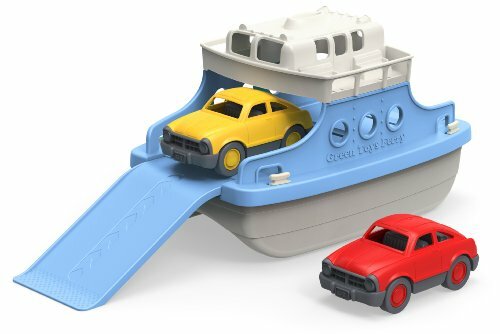 This Green Toys Ferry Boat With Mini Cars gives your toddler a toy that is perfect for both tub and dry ground play. It is made from 100% recycled material and is BPA, Phthalate and PVC Free. Made in the USA, this is an environmentally friendly toy, designed to protect you and your child, but also the environment. This wonderful ferry boat comes with two brightly colored cars. The ramp on the ferry boat drops down so your child can load the cars. Completely suitable for boys and girls, the recommended age for this wonderful bath toy is 3 years old and upwards. However, parents have bought this ferry bath toy for their one year old toddler and found it perfectly suitable for them. A lot of people have bought this boat with cars as a birthday present for a one year old boy or girl. Some bought it as a Christmas present also. The Little Tikes Bath Time Tea Set is a fun bath time toy that your toddler will love and enjoy. The tea pots and two cups have foam saucers that makes it possible for the pot and cups to float around the tub. It also comes with one spoon and a sugar bowl and there are tea bags that double as sponges. Toddlers enjoy filling the tea pot with bath water and pouring it into the cups. The wonderful added benefit of this bath toy is that it can be used outside of bath time giving you great value for money. 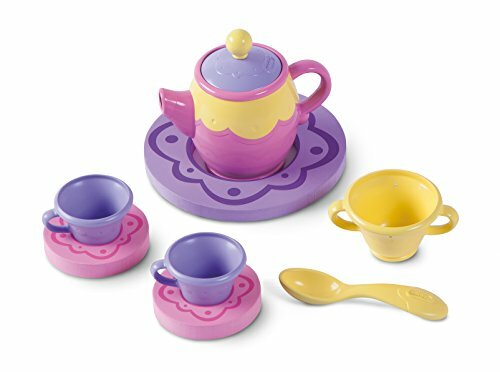 This bath time tea set is great bath time fun for toddlers age 1 to 6 years old as they really enjoy having ‘tea’ during their bath! Toddlers love being able to have imaginary ‘tea’ in the bath! If you are looking for a fun and durable bath or pool toy for your young toddler, then you really should check out the Nuby Octopus Hoopla Bathtime Toy! This happy-go-lucky purple octopus with a goofy face has only 6 legs that turn up to provide receptacles for catching the accompanying rings which are designed to look like a fish, a life preserver and a star. Designed to be used as a ring toss game, each of the pieces of this game can be played with separately by your child, making the toy even more fun. All of the pieces float on top of the water in either the bath tub or kiddie pool. Most children go through phases playing with this bath toy, playing with the individual pieces separately at first, then taking the rings off the legs and trying to put them back on. Then as the child gets older, they try to toss the rings onto the legs first from close up and then from slightly further away. There are no holes in the octopus or rings, keeping them from filling with dirty bath water and then molding inside. This toy is also BPA Free. 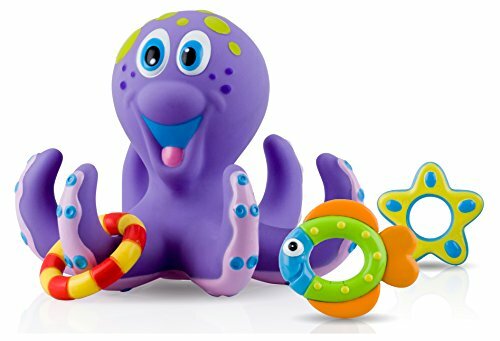 If you are looking for a toy that will allow your toddler to enjoy bath time more, then this Nuby Octopus Bathtime Toy will provide your child with simple watery fun! 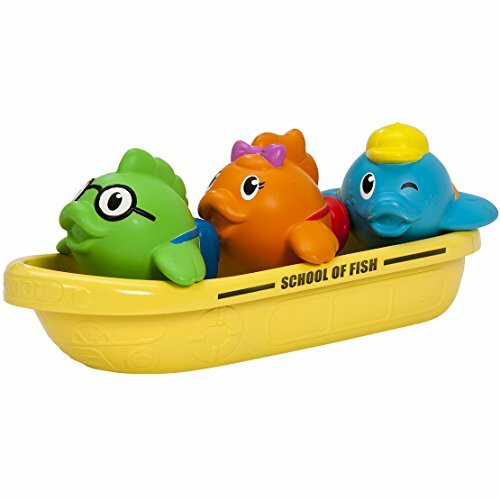 This Munchkin School Of Fish bath tub toy is designed for imaginative play in the bath tub or wading pool. This toy consists of a school boat and 3 little fish that squirt water. The boat itself has a pour spout that can be used to rinse your child’s hair. This School of Fish bathtime toy is perfect for both boys and girls age 1 to 3 year old. Toddlers adore the cute fish in the lovely school boat! Made in the USA, this Green Toys Race Boat is made from 100% recycled plastic and is BPA, Phthalates and PVC Free. The duck inside the boat is removable making this boat two toys in one and you can clean it in the dishwasher. 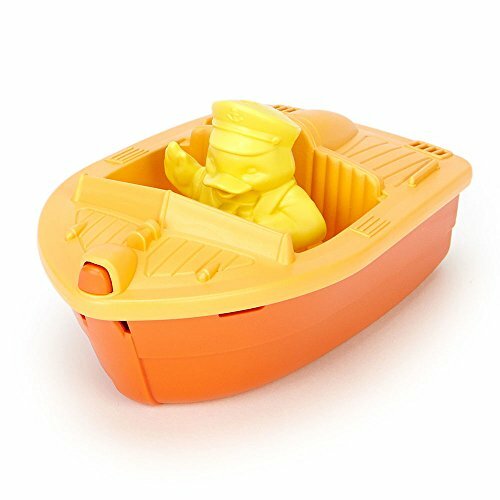 The bath toy is perfect for toddlers 2 years old and up, this boat comes in a choice of 3 colors; Blue, Green or Orange. Floats perfectly making bathtime fun! 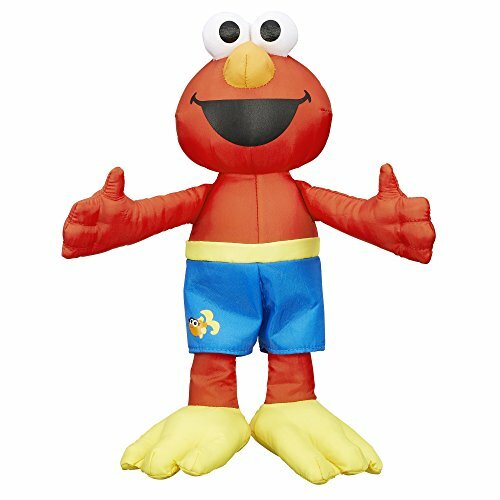 Many toddlers love Sesame Street and Elmo, so what could be better than taking a bath with this cute little PlaySkool Bath Time Elmo Muppet Character! Made from quick dry fabrics and dressed in a cute pair of swim trunks, Elmo makes bathtime fun for toddlers! He’s machine washable and comes with a storage loop for hanging him up to dry. Elmo makes the perfect bath time companion for toddlers age 1 to 4 years old and he’s a very popular gift idea for all occasions. Several parents shared that the quality of this bath toy was much higher than they were expecting and they were pleasantly surprised given the low price. Toddler fans of Seasame Street love Elmo and his adorable swimming trunks! Your toddler can use Elmo in the pool for even more fun! These colorful Munchkin Caterpillar Stacking Bath Cups may not seem like an exciting bath toy, but toddlers just love them! Your toddler will get seven colorful cups, each one a different design with holes in the bottom and joined together, they form a really cute caterpillar. The end cup on the tail of the caterpillar has a fun spinner to keep your little one engaged and entertained while you bathe them or wash their hair. Your toddler will have fantastic fun making the caterpillar swim in the bath water with each cup scooping up water and then watching the water drip through the holes! The cups can be separated so that your child can stack them, effectively giving your two toys in one – a stacking toy and a bath toy for your toddler. For easy storage, the cups nest into each other which parents really like. Several parents shared that this is their toddler’s favorite bath toy and they also play with it outside of bath time, stacking each cup to create their own tower! Toddlers have fantastic fun playing with this beautiful caterpillar at bath time!